Basically, all you need is a normal speaker capable of creating a high pitched noise and a sound reflector to reflect the sound back and create a standing wave. We only need to move the dust on one axis. When the dust ‘lifts off’ it gets blown away by the wind. Imagine an endless farm of screaming solar panels. It’s a scary thought, but it could be a great innovation. 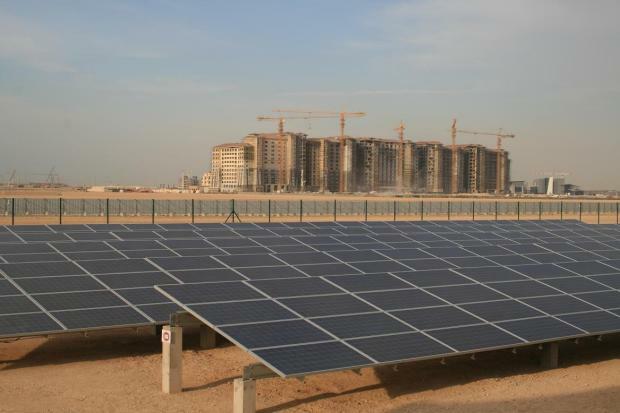 One of the main problems with having a giant solar farm here in Kuwait is that the panels will be coated with dust all year long. It would be very hard to keep them clean and working at full capacity. The acoustic levitation technology is cheap and uses readily found parts. The speaker and the reflector would probably not be attached to the panels themselves. I’d imagine they would slowly move under and over the panels on a fixed track, cleaning as they move along. When I visited Masdar a few weeks ago, dust accumulation was one of the main problems they had with their solar tests. Most of the panels never reached the levels they were capable of even when the sun was beating down. I don’t know if it makes sense economically, but it seems like the idea is worth exploring further. Anyhow, great thinking but seems like all the objects were basically floating in place. If the dust was to be levitated using this method, I can just imagine a floating sand cloud over the panels, unless you have a blower at one end blowing the dust away. Well, the idea is that you just lift them up and let the wind sweep them away. It can’t do that when the dust is on the panel because of friction, so levitating it takes away the friction. It seems like a very elaborate way of cleaning the panels. I can see how it would be of immense value on Mars, where there’s only a few precious solar panels and you want them working as well as you can, and you can calibrate the machines precisely (because there are so few of them and so many sensors and people involved). But for a large solar farm, maybe it’s overkill. I just wanted an excuse to post the video, really. You have great ideas I must say! I find your posts very interesting and creative. Have you thought of talking to the Ministry about your ideas and projects ? All you now have to worry about are the stray-dogs congruating around the foundations of the mirrors..? !